Drafting Concepts is a Sunshine Coast and Brisbane residential building design company. Our home design process leverages high technology software and drafting tools to allow us to create accurate designs for new homes, renovations, alterations, and home extensions. 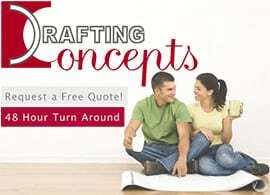 We can provide both builders and home buyers with a free drafting quote to start off their project. We specialize in the Sunshine Coast and Brisbane areas allowing us to stay up to date on local building regulations. Drafting Concepts is owned and operated by Daryl Wood and Kwang ja Lim. Daryl has been involved in the building industry since 1993 in the Sunshine Coast area with extensive experience in all phases of home design and construction. We specialize in home design working with both builders and future home owners.